Hello, my name is Rolando. I've created this website due to my passion for landscaping. As the phrase goes that "If You Can Invision It, You Can Do It" is very true based on my personal experience. I performed all the projects on my property from DIY lawn sprinkler system, landscaping walkways, patio arbor , wooden gazebos, an outside playhouse, carport, greenhouse and overall landscape design. I will be providing photos and writing articles on phases of each project. I will also be providing links on resources that may benefit you. My intent is to share my experiences and get feedback on your ideas to improve my garden. A garden is always evolving and like most of us by trial and error. My experiences relate to climate zone of 7 thru 10, that is Southern California and Central Texas. From sandy to clay soils, most plants are very resilient. By originally modifiying the soil for the particular plant, you will find that it will adjust as it gets established. Do not hesitate to relocate your plants if you notice that they are getting too much or not enough sun. 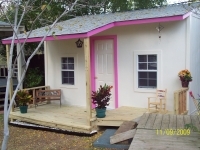 I will be posting numerous photos of my projects to give you an idea of what you can accomplish. Some of my articles will show a before and after phase and others won't. I did not realize how important it was to maintain a photo record until I decided to start this website. You can click on the photos for a full view to get a better look. I am not a contractor of any sort. My landscaping structures and garden have evolved by integrating my ideas, research through books, and a very helpful medium is attending garden shows. I do also recommend attending open houses on new construction. Developers attempt to attract home owners by showing off their best and that includes landscaping. If you will notice that when you are driving down the street, the houses standing out the most are not necessarily the new ones but the one that is well maintained. The photo on the left is a project I did Fall 2009. It is a 12' x 16' playhouse for my 4 year old daughter and as for all the projects listed, it was my first time doing them which goes to show that you can to anything once you put your mind to it. One of several Patio Arbors I built is shown on the right. This idea was a combination of what I saw in a magazine which was a simple two feet width walkway to a comfortable sitting area where one can enjoy the afternoon breeze. An area that most homeowners do not get full use of because of City easment restrictions is the driveway. Having a carport provides much more flexibility and not just for the obvious reasons of protecting your vehicles. A shaded carport is an oasis when relaxing and enjoying the company of your neighbors. Articles on how to are posted on the left side of the page, and the list will increase as my projects do. If you reside in Arlington Texas or surrounding area I can provide some suggestions on how you may want to implement some of your ideas. I look forward to a healthy discussion. If you need to contact me, the message board is active and e-mail is posted. The photos below are my latest addition though, at the time I did not kept construction photos. This is an idea available by Pintrest website. I modified it to fit my landscape. It is 10 feet wide, 6 foot long and a ceiling of 6 feet allowing for ample room. I also installed an outlet for versatility. In addition, I just finished constructing a three tier tree deck and installed rope lighting to accent it's design.